I am so excited!!! Look how pretty my Santa has wrapped the presents. In the package that said "Open now" was this lovely heart ornament, and chocolate- yummy!!! Thank you so much secret Santa! 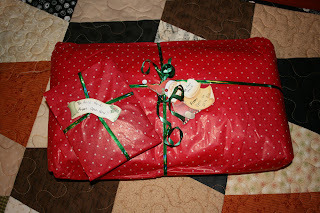 My Santa is VERY secret this time- no name anywhere- not even on the return address..... There is an envelope taped to the back of this gift, so I guess I won't find out who you are until Christmas..... But THANK YOU so much for these lovely gifts. Now I need to hide this until Christmas. Oh exciting! Someone is being very secretive. Secret Santa looks like fun!